It has not got much notice yet, but three CIS players are vying for a spot on the Canadian under-20 women's soccer team its training camp in Vancouver. 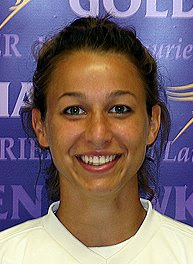 York midfielder Alicia Donaldson, Laurier midfielder Alyssa Lagonia (pictured) and Ottawa Gee-Gees defender Amanda Robinson are among the 24 hopefuls at the camp, which goes until Sept. 10. The understanding here, from someone who should admit right off the top that he's not a footy expert, is that Canada will go to Four Nations Tournament before it finalizes its lineup for the Nov. 19-Dec. 7 U-20 Women's World Cup in Chile. Lagonia and Donaldson each have strong ties to the Toronto Lady Lynx, while Robinson, who's one of the best free-kick takers in the CIS, played with the W-League's Laval Comets this summer.